Last July, I moved from my hometown of St Petersburg, FL to Oak Ridge, TN. I embarked on this new adventure with excitement, trepidation, and an open mind. While I expected to miss friends and the routine of my previous life, I didn't intend to miss this small but meaningful tradition. Nearly every Sunday, I'd venture early in the morning over the Gandy Bridge that connected North St Petersburg with South Tampa, and drive out to the small, run-down part of the city encircled by Palm River. Down a nearly one-lane street lined by dismal residential property and cut in half by a railroad, there sits a glittering, golden temple on modest lakefront land. Photo by FoodiePatootie. All other photos in this article were taken by me. 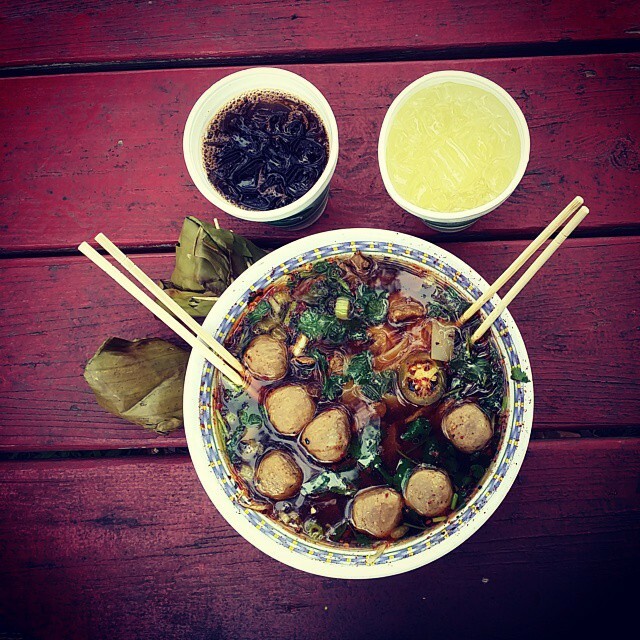 My favorite: Laos-style Pho soup. I'd order a soup, spice it generously with chilis, hot chili paste, and fermented jalapenos (with the juice!) before grabbing a beverage or two and my favorite rice snack. If I were feeling extra-adventurous, I'd grab a bag of fried banana, sweet potato, and taro. Eventually, they phased out the taro, which I assume was to ease the communication between the SE Asian chefs and the uninformed caucasian customers - but it was sorely missed! Sweet, friend, crunchy, and soft in the middle. 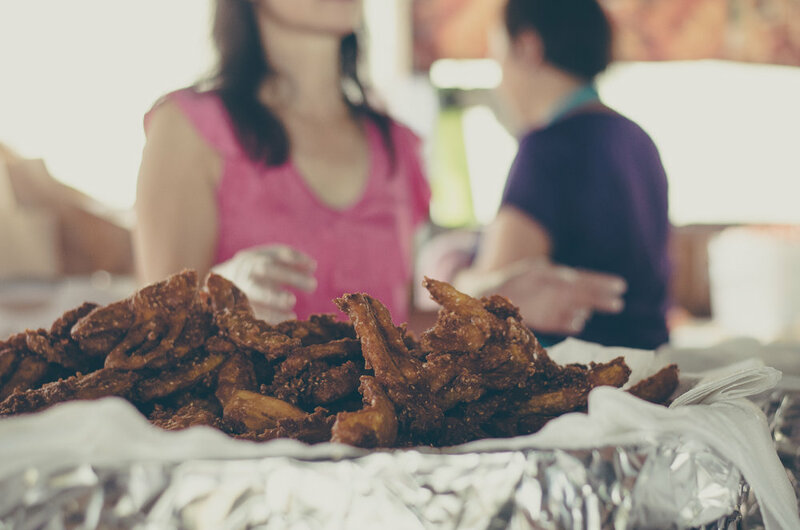 These fried treats would have a line that wrapped the public meeting hall! After indulging myself with hot soup and sweet treats on their expansive picnic-table seating area on the Palm River, I'd head to the temple, remove my shoes, and enter. As the years passed, more people heard about this hidden gem and it became less and less quiet inside the temple. So much traffic, with scuffling feet and flashing cameras. Nevertheless, I'd choose a worn floor mat and sit in meditation for 10 - 20-minutes. If you're ever in the Tampa Bay area of Florida, I encourage you to visit this local gem. This place holds such spiritual, emotional, and traditional significance in my heart. Even if you go only for the food, it's worth the trip! Go early. They say it opens at 10 AM, arrive around 9 AM. You'll get stellar parking and first pick at most everything (though there will definitely be folks already in line before you). Bring a friend, significant other, or small group. It's a pleasure to experience this place with others. Do a walk-through and map out your meal(s). You only have one stomach but certain things can be taken to go. Go light on the spice - you can always add more! Bring reusable bags, your own utensils, and a cup if you'd like to reduce waste. Prepare to spend a few hours, it's worth it. Check your table for creepy-crawlies, you are outside! Make sure to get your take-away snacks early as they do run out. Be gentle with your chefs, as many of them speak English as a third or fourth language (or not at all). Visit the temple! Remove your shoes, turn your camera flash off, and play the quiet game. Consider picking up a piece of Buddhist literature from the table on your way out. They're written in plainspeak and can bring you peace in the darkest of times. It brought me pleasure simply to share this place with you, even though I won't be visiting in the near future. Do you have a special or spiritual tradition you enjoy regularly? Please share with me as I navigate this new life, developing new traditions to light my days.